The 2019 NCAA tournament is here. The greatest long weekend in sports is a day old. And the first 12 hours of the Madness belonged to the Southeastern United States. To its conference. To some bluebloods. But most notably, to two mid-major guards who hail from sunny states off the Atlantic. They could hardly be more different as basketball players: one a ball-dominant, do-everything playmaker, the other a record-breaking, do-one-thing sharpshooter; one a sure-fire top-five draft pick, the other barely an NBA prospect at all. But they are both what March is about. It’s about the stage that is open to all. It’s about equal opportunity, and the unheralded hoopers who seize it. Many mid-majors just barely failed to on Thursday, falling short of upsets in a variety of ways. Top-four seeds went 8-0. The Big Ten went 5-0. The SEC went 4-0. But the magic of March was alive and well in the hands of a sophomore from tiny Dalzell, South Carolina, and a senior from Orlando. Both got their first NCAA tournament wins. Both captured America’s hearts. And they lead our five takeaways from Thursday. 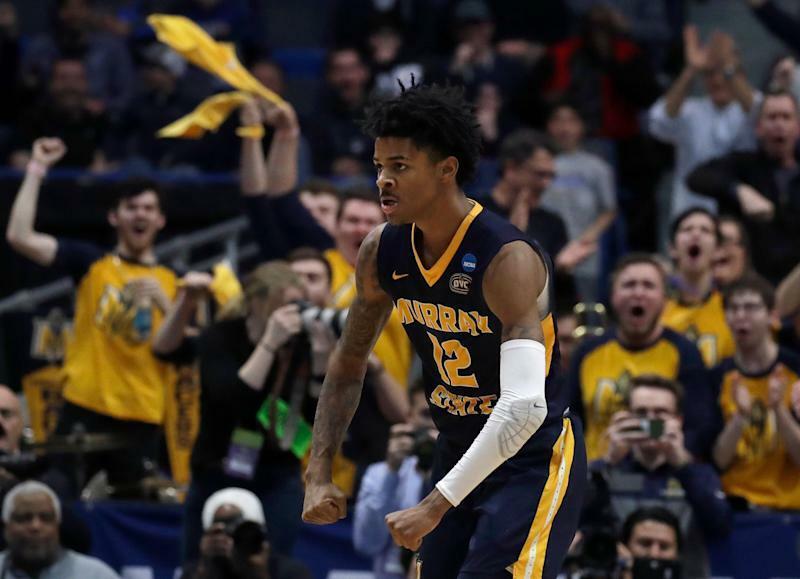 Until Thursday, for the vast majority of the basketball-watching public, Ja Morant was but an unseen legend. A basketball hype train chugging along in middle-of-nowhere Murray, Kentucky, up NBA draft boards but out of sight. Then he arrived at the NCAA tournament. Hoopheads put a face to the legend. They saw the skill set that has had NBA scouts drooling. And they started drooling themselves. Should he be in the conversation at No. 1 in June’s NBA draft? His dad thinks so. Most NBA execs likely think not. But Thursday’s performance further cemented him at No. 2. And a Saturday encore against Florida State, a true power-conference foe, would further grow the legend. Several hours after Morant and Murray State won the afternoon, Fletcher Magee and Wofford won the night. Magee, another walking small-conference folk tale, entered his first NCAA tournament game two 3-pointers shy of the all-time Division I record. Rather than merely break it, he smashed it, draining seven of his 12 triples. He let fly from everywhere, with defenders anywhere around him. He splashed through contact and with his hips seemingly facing away from the basket. He rose up off the catch and off the bounce. He has a little Jimmer in him. A little Redick. A little Steph. He is not on the level of the latter two, and likely never will be. But he now towers over them in NCAA record books. And he, like Morant, is not done. Seton Hall couldn’t stem the Terriers’ 13-of-28 3-point barrage. The next team to try will be Kentucky. John Calipari and the Wildcats could learn from Seton Hall’s defensive pressure. But sometimes there’s no antidote for lethal outside shooting. In between Morant and Magee, Thursday was, in all honestly, somewhat bland by March’s absurdly high standards. Some popular upset picks fell flat. Kansas stomped Northeastern. Old Dominion never really scared Purdue. Yale spotted LSU an 18-point lead, then adjusted and outplayed the third-seeded Tigers for much of the second half. The upset-preventing problem? The Bulldogs simply couldn’t get outside shots to fall. An 8-of-37 mark from beyond the arc doomed a 36.5-percent 3-point shooting team. It was that simple. On the other hand, Vermont was borderline boiling from downtown. The Catamounts made 16 threes ... but rather than upset fuel, the 16 triples were the most by an NCAA tournament first-round loser ever. Florida State hit just three – meaning it was minus-39 from behind the arc – but bullied the No. 13 seed, and used depth and physicality to pull away in the second half. The Seminoles will be quite the test for Ja and Murray State in round two. The Belmont Bruins had Maryland on the ropes, but the Terrapins foiled their final-possession back-door play. Villanova, in now-typical Villanova fashion, made one too many plays late for St. Mary’s to counter. New Mexico State ... well ... the day’s wildest (and longest) final minute offered up a few chances to at least drag fifth-seeded Auburn to OT. The Aggies passed up one, and saw two others clang off the rim. And as for the 15s and 16s? Only one of them ever really had a chance. Bradley really shouldn’t have had a chance. But second-seeded Michigan State, for almost 35 minutes, let the Braves hang around. Tom Izzo’s bunch buried them late, but only after a controversial Izzo tirade, and only after Sparty showed it isn’t a true threat to Duke in the East region. Elsewhere, Michigan, Gonzaga and Kentucky won by a combined 92 points – and UK’s victory sealed an undefeated day for the SEC. Though the biggest news of Thursday on the top two seed lines might have concerned the Wildcats: Forward P.J. Washington is doubtful for UK’s second-round game against Wofford. That gives Saturday’s showdown even more upset potential than it already had. Wofford-Kentucky is our pick for must-watch Saturday game. Other contenders: Florida State vs. Murray State and Michigan vs. Florida. The Gators held off a furious Nevada comeback, and could give the Wolverines trouble. 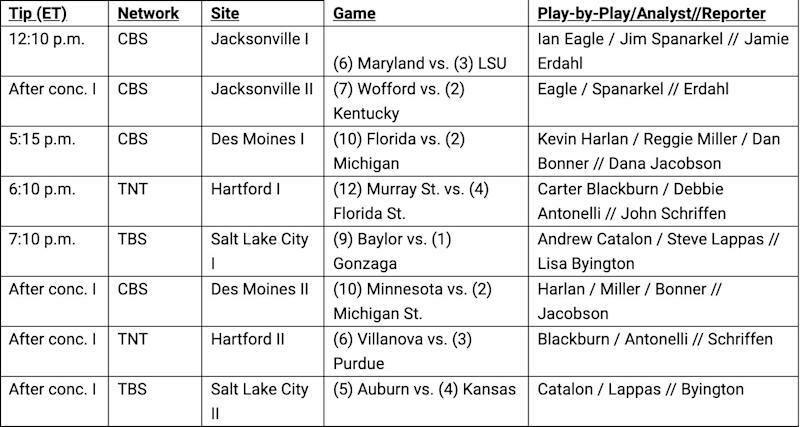 Saturday's NCAA tournament TV schedule. In the meantime, Jeff Eisenberg has Friday’s games ranked from 1-16 by watchability. Hopefully they’re a tad more eventful than Thursday’s.